It’s release day for my dear friend, Laura Diamond! Rogue shapeshifters, Santamo and Legeny, believe they are kings blessed with the power to shift into lions. Using that strength, they brutally defend their land from the British building the Ugandan Railroad that threatens their way of life. On a particularly ruthless raid, Santamo meets his match—Naserian. He spares the girl’s life, a move that fractures his relationship with Legeny and blurs his visions of cleansing his territory of invaders. While the pile of bones in Santamo and Legeny’s cave grows, so does Santamo’s attraction to Naserian. When she challenges him to give up his murderous ways, will Santamo stay on the path of death he believes is his duty, or will he choose Naserian, and love? 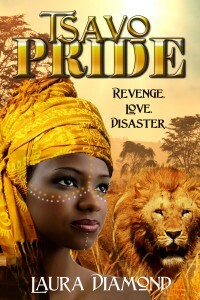 This entry was posted in Uncategorized and tagged #ReleaseDay, Books to read, Laura Diamond, Tsavo Pride by Lynn Rush. Bookmark the permalink. Thanks so much for your support, Lynn!